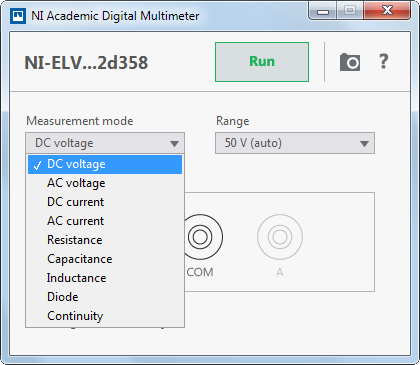 This topic introduces the configuration options on the Digital Multimeter (DMM) Soft Front Panel. Measurement mode Specifies the type of measurement. Some options may be grayed out if a hardware resource conflict occurs. Range Specifies the range of the measurement. When you select Automatic, the DMM automatically chooses the range that suits the input signal. DC voltage Measures the DC component of a voltage source. AC voltage Measures the AC component of a voltage source. DC current Measures the DC component of a current source. AC current Measures the AC component of a current source. Diode Measures the voltage drop across a diode. 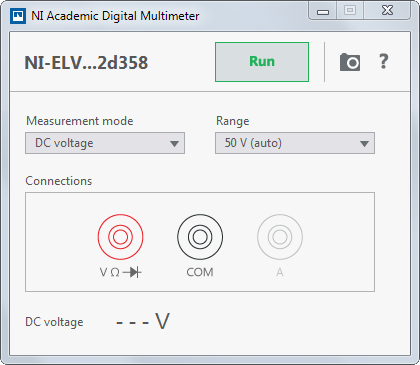 When you select Diode, Range specifies the threshold for a valid diode measurement. Continuity Measures continuity. The threshold for continuity measurements is 15 Ω.